This page is for the 2013 remake. For the original 2009 game, see Armored Hunter GUNHOUND. A remake of Armored Hunter GUNHOUND that was previously released only in Japan in 2013 for the PlayStation Portable and as a free update for owners of the original 2009 PC game. The game has occasional visual and audio issues along with some game-breaking bugs, and does not feature the ability to remap keys. Its exclusive fullscreen mode can cause the game screen go black, especially when played under Windows 10. See here for potential fixes. As of October 16, 2018, this game is no longer available for purchase from Playism and Steam due to temporary suspension of the DRACUE Co., Ltd. This game was removed from digital distribution services as of October 16, 2018. In the Japanese version of the game, the Options menu is accessed by pressing ↵ Enter, whereas the overseas version has its Options menu in the title screen. General settings from the overseas version. Options include windowed, fullscreen in original resolution, pixel-perfect scaling, and stretched fullscreen scaling. Toggled with Alt+↵ Enter. Window can be resized by dragging the edges. Use Borderless Gaming, but the game will be stretched to your monitor's display resolution. A smoothing filter can be found in the Options menu, but the setting does not work in the overseas. Pressing F8 or F9 however disables and enables the smoothing filter respectively with Bilinear interpolation. Game is capped between 60, 30, and 15 FPS. 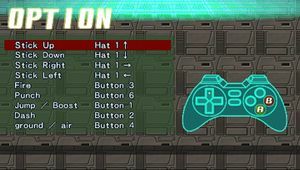 Controller configuration menu from the overseas version. Uses a pre-defined set-up of A, S, Z, X, ⇧ Shift, Ctrl, and Cursor keys for keyboard. See this guide to remap keys with AutoHotkey. Mouse not used at all in-game. Controller is not configured by default. There is no exit option in the game. It must be forcibly closed by pressing Alt+F4, pressing Esc in windowed mode, or closing the game window. A visual guide can be used for the recommended controller set-up. Xbox prompts are used in the overseas version. Game registers DualShock 4 controller as a generic DirectInput controller. Xbox prompts are shown in the overseas version and PlayStation prompts in the Japanese version, regardless of input method. Controller must be plugged in before starting up the game. 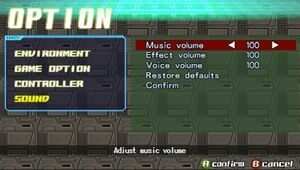 Audio settings in the overseas version. In-game dialogue are text-based and voiced-over. All dialogue is spoken in Japanese. This game's exclusive fullscreen function can cause the game screen to go black/gray that prevents the game from being playable, especially when played under Windows 10. Right-click the game's title from the Steam library, and click Properties from the drop-down menu. In the General tab, uncheck the Enable the Steam Overlay while in-game option. Close the Properties window and play the game. The game should display properly without Steam Overlay. Go to your video card's control panel such Nvidia Control Panel for Nvidia users. Select Manage 3D settings and go to the Programs Settings tab, then added the game by clicking the Add button and find the game's executable (GunHoundEX.exe) found in <path-to-game> to add its own profile in your video card's control panel. 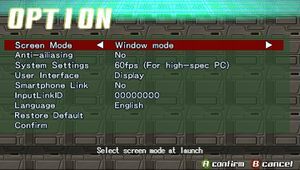 Find Antialiasing - Mode on the game's list of setting features and set this to Off from the drop-down menu. Click Apply to save the changes and launch the game. The game should be able to play normally in fullscreen. The game's graphics may be distorted depending on your display's aspect-ratio. ↑ 2.0 2.1 File/folder structure within this directory reflects the path(s) listed for Windows and/or Steam game data (use Wine regedit to access Windows registry paths). Games with Steam Cloud support may store data in ~/.steam/steam/userdata/<user-id>/273240/ in addition to or instead of this directory. The app ID (273240) may differ in some cases. Treat backslashes as forward slashes. See the glossary page for details. Tested by deleting the neko.jpeg file from the installation folder. Tested turning on and off anti-aliasing setting from my video card's control panel and can confirmed that turning it off by adding a profile for Nvidia Control Panel fixed the black screen problem for exclusive fullscreen. Using Borderless Gaming helped bypass the broken fullscreen on Windows 10 v1803, but the game is slightly stretched due to the game using the same aspect-ratio as the PlayStation Portable version and my display 16:9. This page was last edited on 23 March 2019, at 00:14.